When the time comes to look for a house there are almost too many things to consider. Is it in a good neighborhood? How are the schools? How many bedrooms/bathrooms? Is there room to grow? What are the city ordinances regarding adding up or out? And of course...how old is the roof? Well, when we started our house hunting journey, those are just a few of the questions that we set out to answer. Knowing we were getting a killer deal on our house (snagging it before it went on the market), we were ready to settle for just about anything. When we were going through escrow and had our house inspected, everything passed. The inspector did say the roof may need to be replaced in a few years, but other than that we were good to go. Since I was so excited to finally be in escrow and that much closer to owning a home, I quickly stashed that little tid bit away and just moved forward. At the persistence of my super smart TH we had a roof inspector out just in case. Sadly one of those homeowner problems came true; we would in fact need a roof and sooner rather than later. BOOOOOOOOO!!! After getting a couple quotes, we decided to continue on with our home, because even if we did pay $10K later down the road, it was still cheaper than anything else we had bid on. 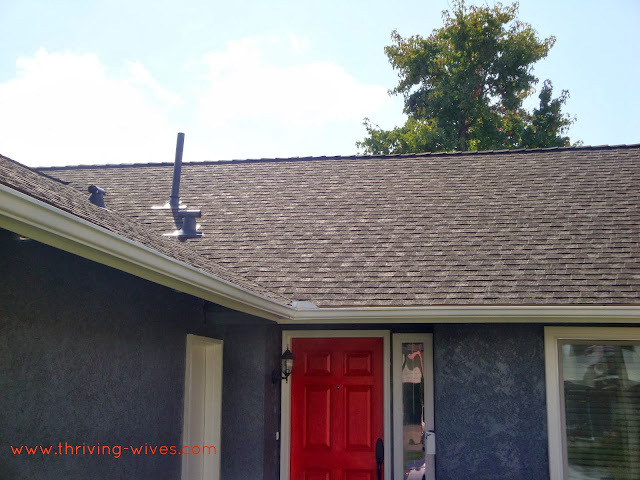 After we painted our home, that ugly old brown roof stood out even more. We knew we had to gear up to have it replaced in the Fall or take the risk of waiting and having major damage later. We enjoyed our house for the summer and made plans to get that bad boy taken care of before the holidays. My TH and I were not willing to wait it out in hopes of sneaking by, I of course did suggest that, I mean this is Orange County. But in all reality, knowing our luck, we would choose to wait and then it would be the heaviest rain season in history. Not worth it, not one bit. Get outta here brown roof! 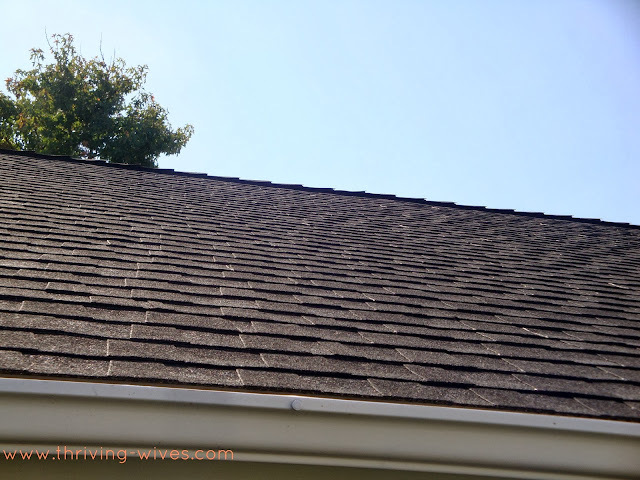 It's not like our roof ever looked horrible to the untrained eye, but to a professional, it was overdue. The previous owners had not replaced their old roof, rather just thrown a new one on top and patched it up. That fact alone was going to nearly double the labor costs to tear it off. My first thought, "Can I get up on the roof and help rip it off to save a couple bucks? I do love a good work out". Sadly, the answer to that question is no. Feeling overwhelmed with the topic and where to even begin to look for a legit roofer I enlisted my research loving TH to do the job. He got right on it using the help Angie's list, Craigslist and Yelp. He quickly found a few candidates and made appointments to have them come and take a look. We wanted a serious, no joke estimate with someone examining all the nooks and crannies of that old roof. We were getting a wide variety of numbers thrown our way and since we were on a tight budget, we wanted the most reliable, licensed person we could find...at the lowest price. Finally, after three different meetings, we found someone UNDER $10K. When we got a quote for just under $8K, we did not hesitate to call for more information. It had to be too good to be true...didn't it? Before we made plans to accept the offer, my TH did some research to ensure that the contractors license was up to date. He also checked some prior jobs to check references, a new roof was not something to mess with (apparently). Another selling point was that all the employees were covered with the companies liability policy and we would not be held liable should anyone get hurt while working on our home. The last thing we wanted was someone falling off our roof and then suing us...no way. Finally, when it all checked out, we decided to go with Shulman Roofing out of Huntington Beach. The owner, Joe, worked with my TH and answered all our questions prepping us for his start date. Before he could send out the contract, we first had to decide on what we wanted. I had no idea there were so many roof types to choose from. Asphalt, copper, cedar, metal...I mean, yikes! I wanted ones that looked nice and went with the color of my home...? Is that enough information? Thank goodness TH was in charge of this project, there was a lot for me to learn! 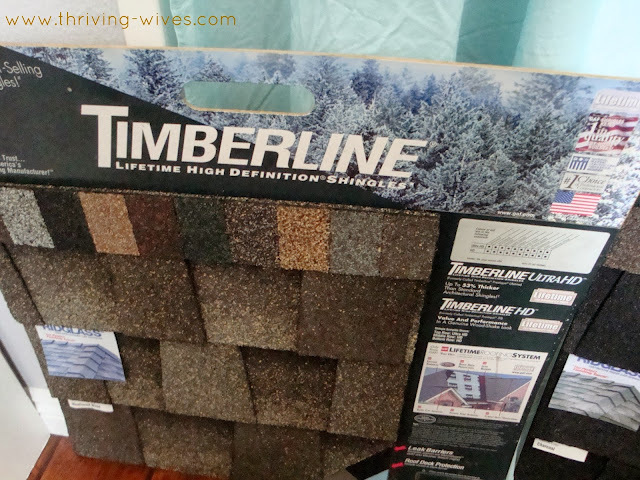 One shingle color...not at all a compliment to our grey home. Now this charcoal was a muuucchhh better fit. Done. Before we started construction we were sent a contract to review. 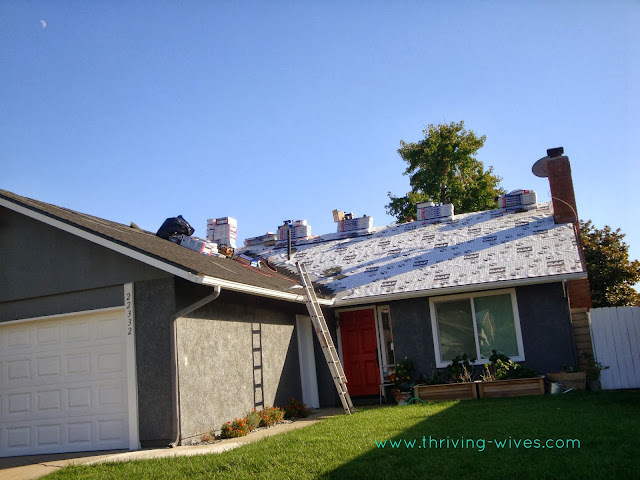 The labor and removal of the existing roof were listed (I made sure that meant both layers), any damage they found they would repair at a cost and an outline of the materials needed were all included for our approval. 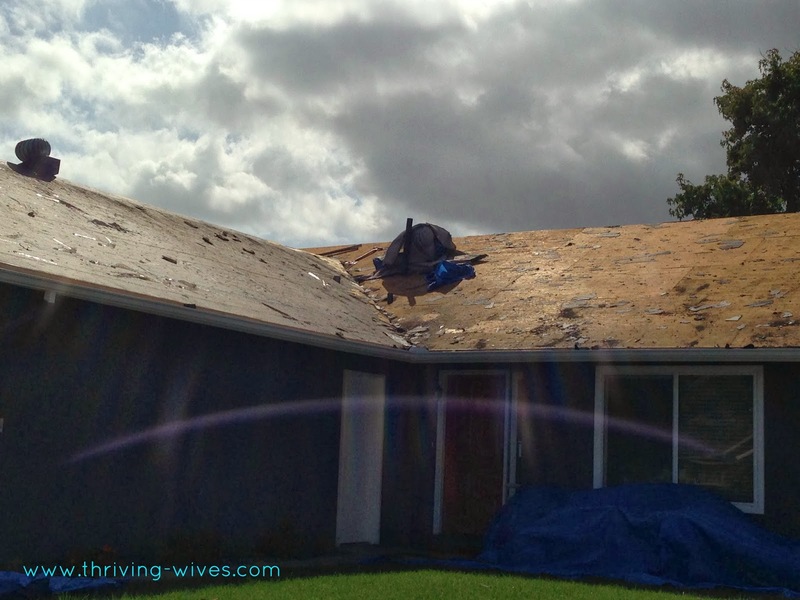 Despite my husband heading this roof project, I made sure that we wouldn't be "nickled and dimed" once they started. The last thing I wanted was for them to give us a quote, find all this damage and then do the work without consulting us. I was assured that wouldn't be the case and anything they found that needed extra repair would be brought to our attention. 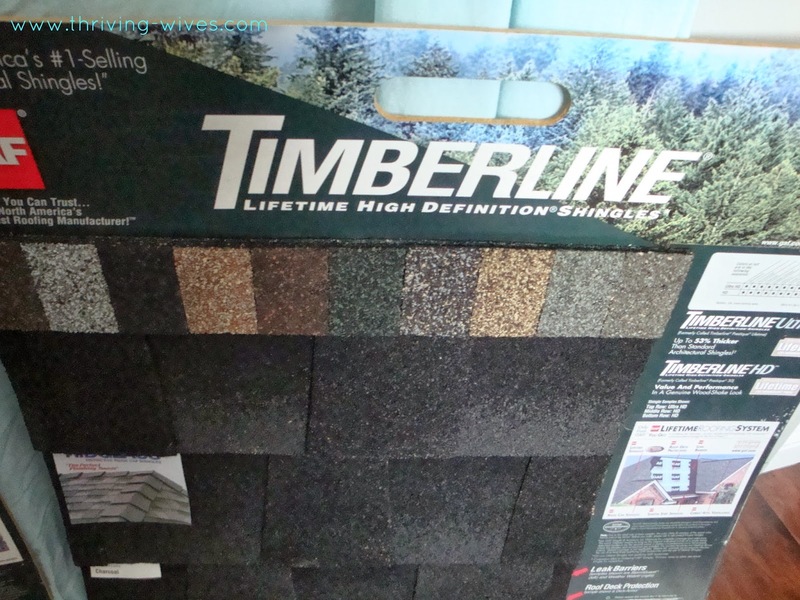 We also had to decide on the warranty and the life of our roof. Did we want a 5, 10 or 20 year roof? A warranty that would carry over to new homeowners if/when we decided to sell the house? We figured a brand spankin' new roof would only add value to the house and would be an bonus selling point should we want to sell within the next 20 years; hey, might as well go big. Finally, we signed, sent back the contract with our deposit and prepared to get this done in the next few weeks. Then the day had arrived...as did a not so bright weather report. Regardless of the 90 degree weather we had been having, the day we were to start construction, there was a 30% chance of rain. I of course saw no reason not to begin, I had to decorate for Halloween for goodness sake and could not be waiting all of October! Thankfully, the wise Joe Shulman had been down this road before and decided to push back the start date until the weather was back to being clear and sunny. Fine, fine, fine...I guess we shouldn't NOT have a roof when it pours rain...and pour it did. Good call Joe! Just two days after we should have started, a big truck with lots of ladders pulled up at 6:45 AM just as I was pulling out of the driveway. The workers had arrived and were ready to get going! Which is exactly what they did...and fast! On day one the entire roof had been pulled off, prepped and the materials brought up and started. As they worked they made sure to cover all of our plants and patio furniture so it wouldn't be damaged with the flying roof debris. Each evening when I would get home I would be astounded at all they had accomplished in such a short time. They were really going to stick to that three day game plan. On the second day the city came and inspected their work and gave our home (and Shulman Roofing) the stamp of approval. By day three the roof was done and it was hard to tell anyone had been there at all. Our new roof is just beautiful and really makes our home even more perfect than before. I welcome a massive raining season now, because our little roof can withstand anything and will be keeping us dry and safe for years (and years and years) to come. I guess this whole process is another tale for the book of "Homeowner Problems" and having to deal with spending so much money on something you so don't want to spend it on...but have to. Have you dealt with any homeowner problems recently? Have any large projects looming in your future? Your new roof looks great! I'm glad you were able to get the charcoal ones, it's such a nice look! Just out of curiosity, what made you choose to get shingles? I love how they look but was wondering how durable they are. I am going to be getting roofing repairs done on my Mililani house soon. We get a lot of rain so durability is a must. However, there are so many different roofing options available now that it can be overwhelming to choose the right one. Thank you so much for stopping by and all the compliments on my new roof! As for why we chose shingles it was for a couple reasons. First, I hate tile and second since we don't get much rain down here in So Cal, it was the best choice for our home. I think the best thing for you to do if you are looking for a new roof for your home is to consult a professional in your area. Start like we did, with a bit of research then invite them out to your home and ask a TON of questions. Remember, they are working for you, so don't be shy and make sure you get the most for your money and a quality that will last a long time!